PREVIEW: Mon., Sept. 24th, 3-6 pm * CLOSES Tues., Sept. 25th, 6:30 pm! 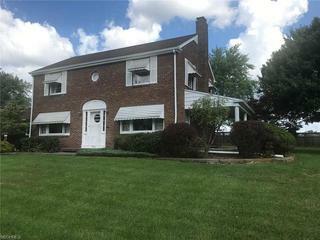 e 3 BR, 2 BA, 2-story brick colonial house w/ rec room and 2-car garage on 120×178 lot. LOW OPENING BID! BUY IT NOW for ONLY $121,000! Contents sell separately. This classic colonial brick, 2 story, 3 bedroom house on a 120′ x 178′ lot, is no longer needed by the owner, and is being sold at public auction with internet only bidding scheduled for closing on Tuesday, Sept. 25th at 6:30pm on the listing brokers website. This property has been well maintained with new roof shingles, high efficiency gas furnace with central air conditioning, and water heater replaced within the past 5 years +/-. There is a large 24′ x 13′ family room with a bar area with a entry door from the concrete apron in front of the 2.5 car garage. There is There is a 20′ x 10 covered patio attached to the east side of the house with access to the 23′ x 12′ living room with wood burning fireplace. On the second floor there are 3 bedrooms with walk-in closets, a linen closet, and a large 10′ x 7′ full bathroom. The 1058 sq. ft partially finished basement has a 24′ x 14′ carpeted rec room with built-ins. There is also a 24′ x 13′ utility/laundry room with kitchenette with access to the 17′ x 8′ storage room. There is also a second full bath room with shower stall in the basement. The large 2.5 car garage has a separate gas forced air furnace that heats the family room and could easily also heat the garage. The property can be purchase prior the the close of auction for a Buy It Now price of $121,000 ($110,000 plus a 10% Buyers Premium of $11,000) with a down payment of $10,000 and closing within 45 days. Come see for yourself!